The itching and irritation of eczema-prone skin verges on the unbearable. Symptoms include blisters, swelling and redness, patches of thickened skin and, of course, intense itching. The inflammatory skin disorder may spring from allergies or family history, according to the University of Maryland Medical Center, or UMMC. Talk to your doctor about oral or topical prescriptions. Additionally, consider using an herbal therapy such as calendula oil for eczema. “Calendula appears to have anti-inflammatory, antiviral and antibacterial effects,” UMMC notes. Calendula oil is produced by infusing the flowers of the pot marigold, Calendula officinalis, in a carrier oil, usually olive or sunflower oil. Make calendula oil at home or seek the product online and in health food stores. Use it alone or as the base for lotions, ointments and salves. Herbalist Jeanne Rose notes that while both sunflower and olive oils contain therapeutic properties, olive oil helps dry and damaged skin, while sunflower oil makes a better choice for oily skin. People suffering from eczema may want to seek calendula oil infused in olive oil rather than sunflower oil. According to the UMMC, topical applications containing calendula show some evidence of helping sooth the irritation and itching of eczema, as well as to boost healing. MedlinePlus.com notes that more research on human subjects needs to be undertaken but agrees that evidence for using calendula to treat skin inflammation looks promising. It points to a human trial on women suffering from severe dermatitis relating to chemotherapy treatment. 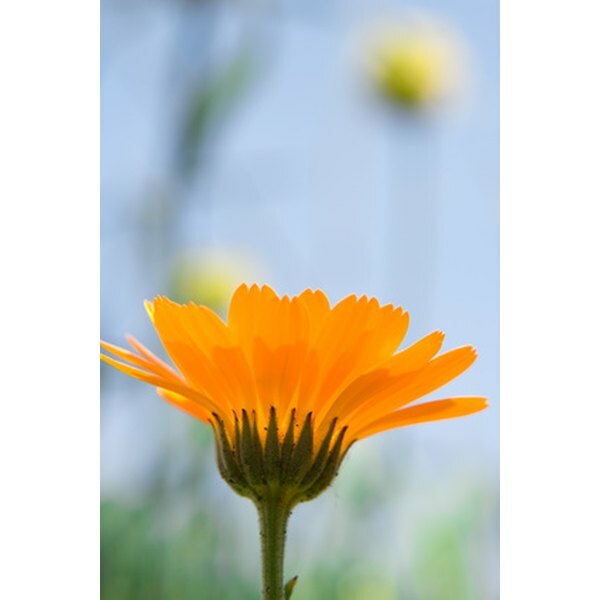 The patients who applied calendula ointment experienced measurable relief. Olive oil boasts a long history of treating conditions such as eczema, notes Drugs.com. Because it contains soothing and emollient properties, it helps soften eczema-plagued skin. It also has antibacterial qualities, which may help protect eczema patients with blisters and oozing skin from contracting fungal or bacterial infections. Purchasing calendula oil costs as much as $50 an ounce. If you grow your own calendula flowers, consider making it at home. Herbalist Jeanne Rose’s formula allows you to make a quart of the precious liquid at literally a fraction of the cost; divide the recipe if you need less. In the top of a double boiler, combine a quart of good-quality olive oil with 4 to 8 oz. fresh calendula flowers. Without placing the boiler on the stove, press down on the flowers with a potato masher or spoon, and allow to steep at room temperature for several hours. Turn the heat to high to achieve a boil, then lower the heat and simmer gently for four hours. Cool and strain into a quart jar or several smaller jars. To preserve the oil, either refrigerate the calendula oil or add the liquid from one 400 mg vitamin E capsule for every ounce of calendula oil. Use calendula oil as a body oil to treat eczema-stressed skin. If you prefer a less oily application, thicken the oil with beeswax melted on a stove top, combine it with the oil and pour into wide-mouthed containers. Apply this calendula salve to any affected areas at least twice a day to soothe the symptoms of eczema. Calendula oil is even edible, and the healing properties of the calendula and olive oils may provide additional help when consumed internally, as part of a salad or vegetable dish. Check with your physician to rule out any drug interactions or side effects.